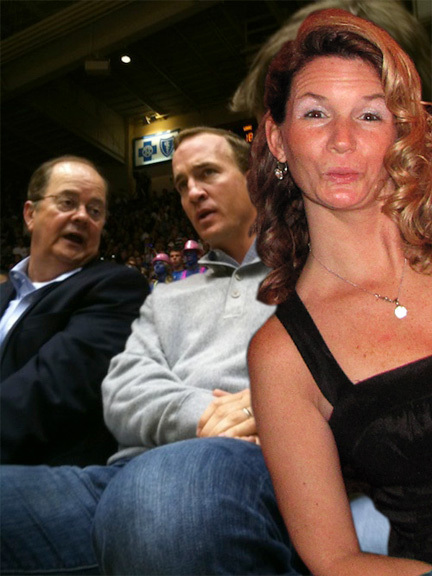 Tammy’s fascination with Peyton Manning has been well documented (here and here) but last night we hit a new low. At some point on Saturday Tammy found out that Peyton was going to be at the North Carolina-Duke game, which of course meant we had to watch the game. I shouldn’t have really said “we” or “the game” because Tammy wasn’t really watching actual game action. Instead she was busy trying to find Peyton in the stands. Not long after the game started I spotted Peyton’s rather unique melon in the front row directly under the basket. Tammy’s reaction was similar to that of a little girl getting a pony for her birthday. He was sitting under the basket that North Carolina was shooting on in the first half and nearly every time down the court I’d hear “I see him” come out of Tammy’s mouth. Look out Peyton!! There’s a Tammy on the loose. Me: What would you do if we were sitting there and he came up and sat by us. Tammy: We’d never have good seats like that. Me: But if we did, you’d prolly start crying. Tammy: No I wouldn’t. I’d prolly be too scared to say anything. Tammy: Oh my God, please don’t say that. But I prolly would try to see if I could touch him without him knowing. I’d try to put my finger on his leg or something and see how long I could keep it there. I couldn’t help but shake my head because she could have cared less about the actual game, which had turned into a blowout at halftime with North Carolina leading by 24 points. Me: You wanna put on a movie at halftime? Tammy: (looking like she had just sucked on a lemon) Nooo?!?! They might interview him at halftime. Me: They aren’t gonna interview him. When the second half started we didn’t see Peyton in his seat and I was hoping to roll that into us watching a movie instead. Me: He’s not even there. Tammy: He’s prolly just visiting with his friends. Me: I think he left. Tammy: Why would he leave? Me: Because Duke is sucking with him there. He’s prolly thinking they’ll do better if he leaves. He just moved to a seat not directly under the basket which meant he wasn’t visible every time Duke tried to score. That meant Tammy lost what little interest she had in the game, but not enough to want to put on a movie. Instead she turned her stalking interest toward the internet in search of more Manning knowledge. At that point the game became background noise as Tammy began digging into the lives of the entire Manning clan. Tammy: I didn’t know that Eli was named after Archie. His middle name is Archibald but his first name is Elisha, which is Eli’s real name. 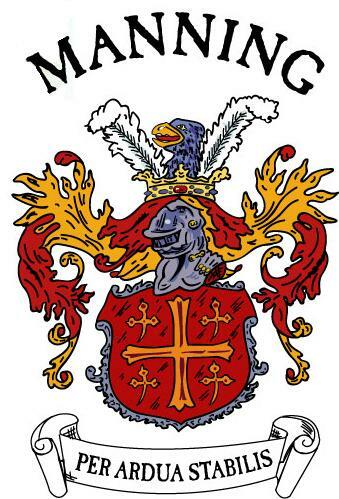 Archie was actually named after his Dad. Peyton was named after his uncle and his middle name is Olivia’s (Mom) maiden name. 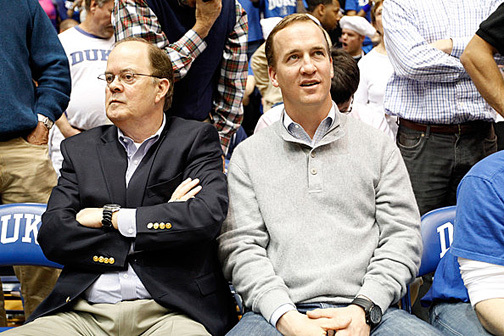 She then found out that Peyton’s older brother, Cooper, was in the financial industry. That excited Tammy because she works in the financial industry. Me: So if we won the lottery would you give some money to Cooper to invest? Tammy: I don’t know. I think he just invests in stocks. Me: Well we could just give him $250,000 or something. Tammy: I don’t think he’d even talk to us for that amount. Me: Well we could give him enough for him to take us as clients and we’d tell him that we had to meet his family. Tammy: Oh, if that’s the case then I’d give him ALL of our money if we got to do that. She found out that Olivia’s father owned a grocery store in Philadelphia, Mississippi and that Olivia’s mother was the second woman in Mississippi to earn a pilot’s license in 1941. Tammy even hit Google Maps to find the house Archie lived in Drew, Mississippi. Tammy: Oh my God!! Archie was born on May 19th, that’s my Dad’s birthday. Tammy: It says Olivia’s birthday is May 19th too. That can’t be right. Tammy: How weird is it that they have the same birthday? Me: I dunno, pretty weird? Tammy: It’s even more weird that my Dad born on May 19th. Me: Yup (partially ignoring and trying to watch the game). Tammy: But what’s REALLY weird is that Olivia’s maiden name is Williams and so was mine. Me: Yeah, that’s weird. You guys are prolly related. Tammy: I don’t think so because she’s from Mississippi and I don’t think I’m related to people from Mississippi. Me: You could be. You should do some research on it. Tammy: My maiden name was Williams and I used to be a Cooper! How is that NOT crazy?! Me: Oh it’s crazy alright. Tammy got upset at me when I told her what I was working on. Tammy: Don’t write about all of that. Tammy: Because I don’t want people knowing all of that stuff about them. All she cares about it keeping his info to herself, but letting everyone know how crazy she is doesn’t bother her at all. This morning she back looking up stuff. She found out the name of the company where Cooper works and that he sold gas and oil stocks. She also told me that one of their aunts said told people that Eli would be better than Peyton. Me: I hope you never meet them because you’d say crap like that and they would think you are crazy. Tammy: Oh please… You don’t think there are people out there that know more than me? I do and I’m jealous of them. Gallery | This entry was posted in Daily Life and tagged basketball, daily life, Football, humor, Peyton Manning, sports, Tammy. Bookmark the permalink.